Our longer term housing options help people get back on their feet. With occupancy for up to two years, our transitional housing programs provide single adults with the time needed to regain their economic and housing stability. Our Permanent/Supportive Housing programs provide individuals and families the time they need to regain their economic and housing stability. Indefinite leasing or rental assistance and ongoing support services allow families and individuals who are chronically homeless to live in a stable environment. 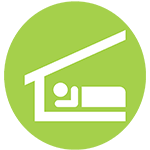 ServiceNet is funded by the Department of Housing and Urban Development (HUD) for 76 supportive housing beds at scattered sites throughout Northampton, Greenfield and Pittsfield. Individuals work with case managers at our Resource Centers to determine their eligibility for permanent housing. Eligibility is based on HUD’s definition of chronic homelessness.